Now here’s something you really need to see. I have attempted to tell my experiences with the minimum of embellishment. Everything I describe in here is something that happened in the game. What’s more, a surprising amount of the interesting things in this story were generated by just letting go and watching the Sims’ free will and personality traits take over. Apparently The Sims has evolved to a point in which the artificial intelligence and social dynamics systems are damned near organic. 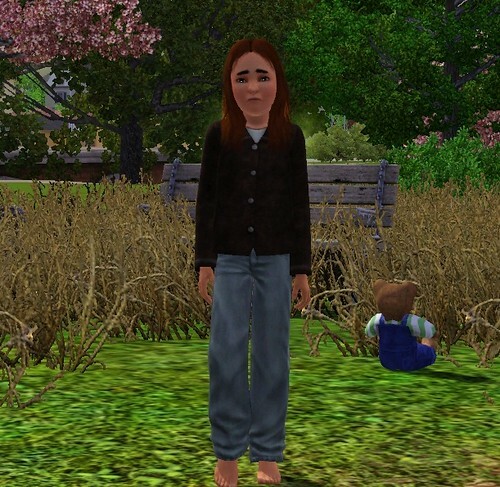 The Sims have dreams, goals, and emotions and their behavior is driven by those qualities, resulting in complex relationships and interpersonal drama. This is Kev and his daughter Alice. They’re living on a couple of park benches, surviving on free meals from work and school, and the occasional bucket of ice cream from a neighbour’s fridge. His daughter Alice has a kind heart, but suffers from clumsiness and low self-esteem. With those traits, that Dad, and no money, she’s going to have a hard life.